Now that’s one lit wedding… quite literally. Video footage of two brides setting their wedding dresses on fire during the ceremony has gone viral for obvious reasons. 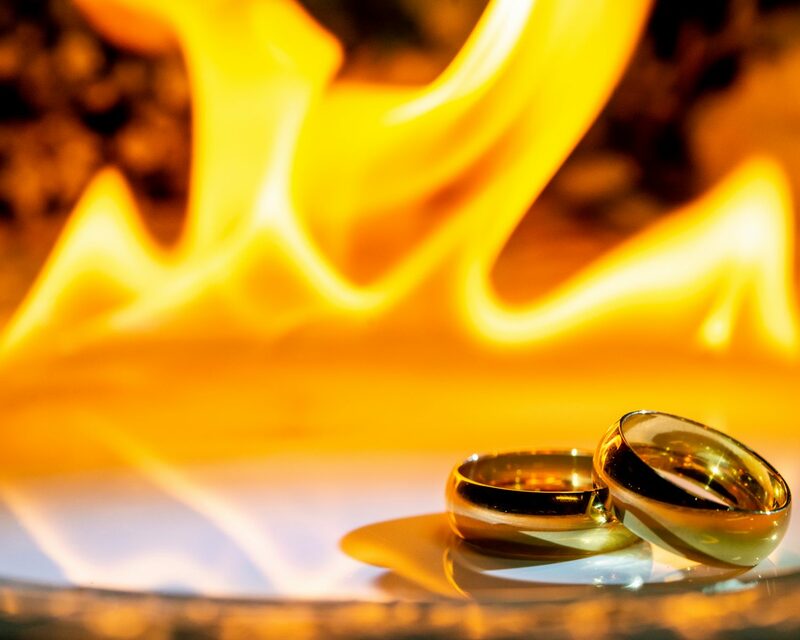 The couple, April Choi and Bethany Byrnes, married at a camp in Mount Vernon, Iowa, on October 13, in a rather unconventional wedding that truly went up in flames. Several guests then appeared to torch the couple’s trains while the two brides held hands and nuzzled noses. The flames, meanwhile, crept up their gowns until both stepped out of their detachable skirts, revealing their outfit swap of the day: white pants and their original ceremony tops. It’s worth noting that the couple has a wedding website on The Knot that details their relationship, including how Choi proposed four times—the first three times, she was rejected and the fourth, Byrnes simply accepting the ring without saying yes. Ultimately, Byrnes finally accepted Choi’s fifth proposal three years later in December 2016. The “Trash the Dress” concept has been around for years, but it’s overwhelmingly associated with water-related activities and shoots. In any and all circumstances, if you plan to discard of your wedding gown after the ceremony in such a method, we recommend you find pros who are familiar with the concept in accordance with the law. Be the first to comment on "Brides Set Their Wedding Gowns On Fire During Ceremony—And the Video Has Gone Viral"